Cool and quirky cafes are all the rage these days, but no-frills places always get my vote if they do something well; Six Eight Kafe on Temple Row does exactly that, food and drink well. They're humble, chilled out, and focus on the quality of their beverages. It's such characteristics which stand out for me, and I am always on the hunt for somewhere to relax with a high quality cocoa, coffee or cuppa. Prior to the birth of Six Eight Kafe , I remember the shop as benjys (more of a sandwich shop). The building itself has had many guises, but it's Six Eight Kafe that's stuck. The winning combo of superb baristas coupled with good coffee makes it a serious contender for the best coffee in town. 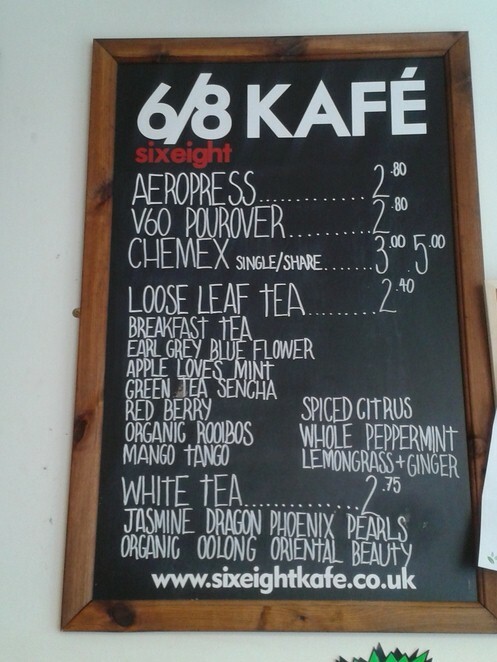 Baristas definitely 'make' a coffee shop or cafe, and Sixeight kafe have got their heads screwed on. They whip up a mocha latte in no time, but it's not rushed and the mug won't have your name scribbled across because frankly, that is tacky. It doesn't need gimmicks or 'cool' tweaks, if the coffee is good you will come, and they will provide. Unlike a lot of independent cafés Six Eight Kafe haven't forgotten about the other beverages. 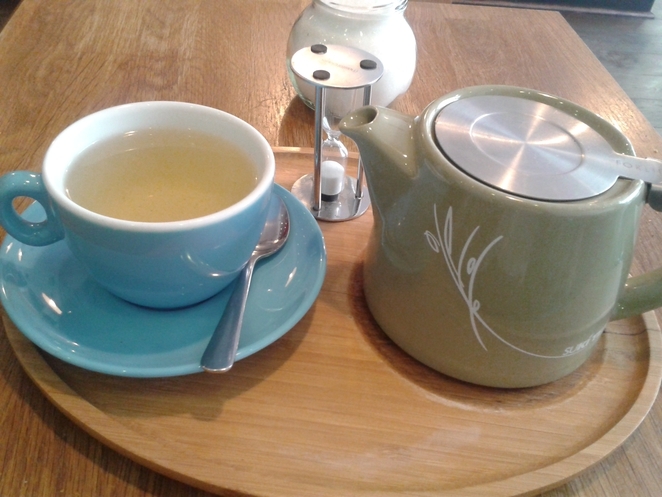 They use suki tea, served in a ceramic teapot which has an internal sieve. I am not a fan of dried fruit teas because when I want tea, I want the proper stuff, but they let me sniff the teas I liked and I opted for the apple loves mint tea. Light, refreshing and minty, my tea was served on a wooden tray and I was faced with two separate glasses full of brown and white sugar, should it have needed sweetening. It didn't and they poured the rest into a takeaway cup when I had to leave. The staff genuinely seemed interested, when they asked if I enjoyed my tea, and seem to make friends with customers. The move away from a pretentious coffee shop and towards a more open, honest cafe experience definitely gets my vote. 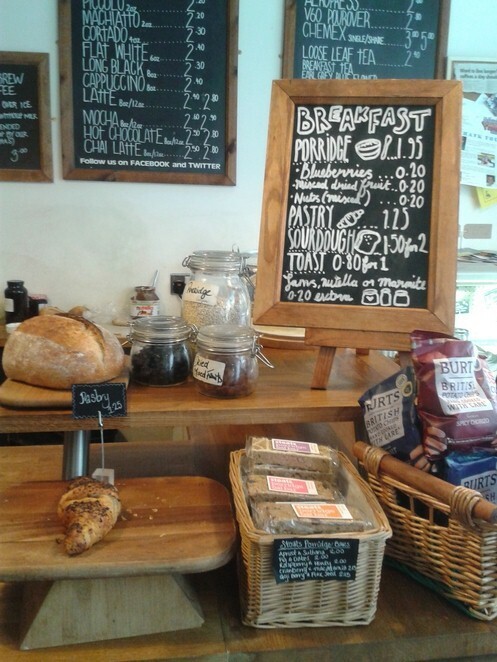 Open from 7.30am Sixeightkafe also serve breakfast: porridge, croissants, sourdough bread for toast and fresh sarnies too. They're right next to Great Western Arcade, and so are part of the independents championing each other. Small seats serve their purpose, as do the tables. The no-fuss venue is perfect for a quick drink, or bite, on the way to work, or if you just need to fill 'the gap'.I can't deny, a freshly baked croissant with a mug of sugary green tea always sorts me out. Six Eight owners aren't merely satisfied with their successful cafe, however. Business partners Aaron Thornton and Richard Trueman (of York's Bakery), are also the founders of PopCultCofee, which "Does for coffee what The Sound Of Music did for hills." - PopCultCoffee. Talk about fingers in pies. The chocolate Guiness cake here is to die for!